We originally reviewed the North Face in September of 2012. The producers of the film have recently released it on Blu-Ray and have generously provided us with two copies to give away. In order to enter a contest to win a copy of the film, please share this review on your Facebook page. We will use a random selector online in order to choose our winners and will post the winners on Facebook! While mountaineering history is chalked full of stories of triumph and tragedy, there are a few that stand out. These stories are our collective heritage and they have built the foundation of our sport. And while some of these are inspirational, others are heartbreaking. And some are so terrible that they chill you to the bone. 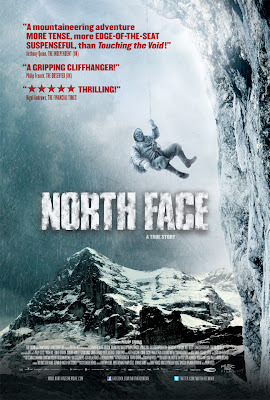 I had long avoided the North Face, a German film about one of the many early attempts on the Eiger's North Face. Because I know how it ends. The story of Toni Kurtz, Andy Hinterstoisser, Willy Angerer, and Edi Rainer is one of those stories that is told and retold. Most of us have read the story in books like The White Spider by Heinrich Harrer or in Eiger Dreams by Jon Krakauer, or in any one of a number of other books or magazine articles that chronicle the tragedy. 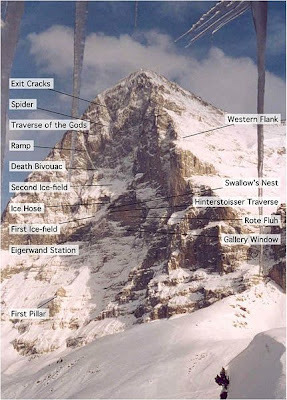 In 1936, teams were lining up for a chance at the "last great problem of the Alps," the Eiger's imposing north face. Attempts on the face were a media sensation for two reasons. First, because it was a terribly dangerous wall that constantly resulted in fatalities. And second, because the whole wall may be viewed from the deck of a nearby hotel through telescopes. After a number of failures two separate teams attempted the north face at the same time. They were composed of the Germans, Toni Kurtz and Andy Hinterstoisser and the Austrians, Willy Angerer and Edi Rainier. As the two teams moved up the wall they eventually combined forces, creating one team that didn't necessarily mesh well. When the weather broke and tragedy struck, the team descended together, and ultimately died together. The North Face film is a dramatization of this ascent and the tragedy that followed. And while some mainstream critics were not terribly enamored by the film, it is an excellent piece that was designed without the stupidity of mainstream American climbing films. There are moments in the film that could have been lifted from something like Vertical Limit or Cliffhanger, but don't seem Hollywoodish at all. For example, in Vertical Limit a cam begins sliding down a crack, threatening to pop out. This is something that simply doesn't happen. Whereas in North Face, a piton starts coming out, while the climber frantically pounds it back in. This is something that could happen, and as such, is absolutely terrifying. Director Philipp Stolzl uses a wide array of elements to keep us in the mountain world. Early in the film I thought that the sound of the pitons was rather odd. They didn't sound quite right when they were being driven in. But then I realized that Stolzl used the sound of the pitons as a static beat in the music, a technique that I've only witnessed one other time, in an a Academy Award nominated film called Atonement where they use a typewriter the same way. And while this little musical element may not seem significant, it provides the perfect example of the level of care put into the film. The one criticism that I have of the story is something that served as a break from both history and reality. Late in the film, Toni Kurtz's girlfriend takes a train up to the gallery window on the Eiger. From there she climbs out on the north face and spends the night trying to be with her boyfriend. I don't think anything like that happened. However, it is understandable that the filmmakers would like to raise the stakes by developing a love interest who has enough of a climbing background that she could spend the night out on the mountain. And while it is a little bit of a difficult moment to swallow, it does help to dramatize the death of the climber.